At 1Collision County Line, we understand the proper auto body repair of your collision damage is critical to the safety and performance of your vehicle. 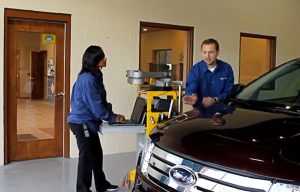 Each vehicle is repaired to factory specifications in our high tech collision repair facility. Our highly skilled auto body repair technicians have attended collision repair training by Toyota, GM, Infiniti and Honda, and use only the highest quality equipment, parts, and materials. At 1Collision County Line, we utilize a highly sophisticated laser frame repair system, operated by ASE certified and ICAR trained technicians, capable of making multiple pulls, critical in returning your collision damage vehicle properly to its original factory specifications. When it comes to automobiles, you can judge a car by its cover! That’s why at 1Collision County Line, we use the latest technology in auto painting systems. Our modern factory finishes incorporate multiple layers of highly specialized paints and urethane clear coats. We constantly upgrade our auto painting technology and equipment to ensure that each vehicle’s finish matches. In our paint mixing area we can match your vehicle’s paint finish exactly. After selecting the correct color variation, we then prepare your vehicle for paint by sanding and applying primer and sealer. After painting and applying clear coat, your vehicle is baked to give the paint durability and a high gloss that will last for the life of your vehicle. Your vehicle’s paint is then inspected and finish buffed to meet our high quality auto body repair standards.